Along Granite Creek Trail, just a few blocks from Prescott’s Courthouse Square, gardeners are harvesting, watering, weeding, chatting and laughing among the plots of zucchini, cucumbers, tomatoes and other fresh-for-picking produce at Prescott Community Gardens. The beauty is, any member of our community can participate. Spring, summer and fall garden spaces are available to rent. Included in the $60 annual fee are a raised organic garden bed, water, tools, seeds, compost and free entry to various special events throughout the year. Each year, after the enjoyment of pulling fresh summer produce and herbs from her garden, board member Patti Indelicato prepares some favorite nutritious, tasty family recipes. “The biggest benefits of community gardening are the quality of the vegetables I grow and the interactions I enjoy with the other gardeners,” says Patti. Patti recently shared her mother’s recipe for Cool Cucumber Salad as well as a recipe for Baked Zucchini Rounds with Rita Carey Rubin, host of Yavapai Regional Medical Center’s Your Healthy Kitchen. Watch A Visit to Prescott Community Gardens on YouTube. Prescott Community Gardens is the brainchild of Prescott resident Colleen Sorenson. In 2008, Colleen was considering a masters thesis project for college and discovered a similar garden in Seattle. In 2011, the gardens became a reality. 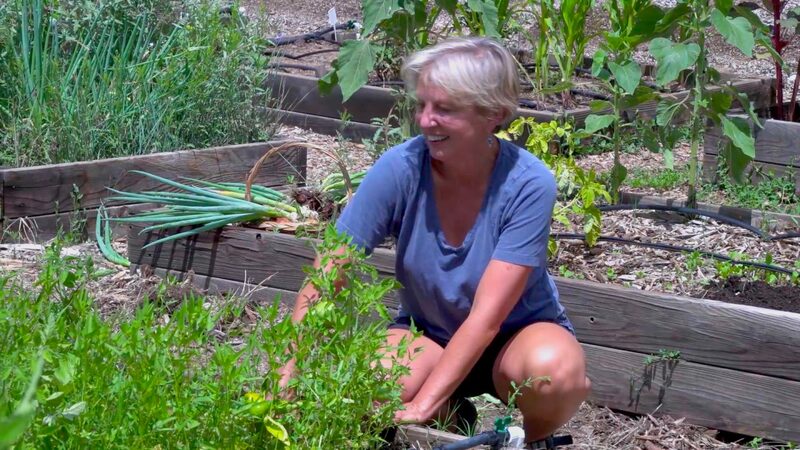 Colleen’s goal is to teach the community about sustainability, how to grow food in the difficult high desert, and how to live more sustainability. The community of friends has flourished. “A garden is a safe place to share ideas no matter your background,” Colleen smiles. “What better place to share knowledge than with your hands in the dirt, together?” Those who join the group often volunteer by helping out with watering, weeding, maintenance, special events, advertising, and more. Special community events include a Soil Amendment Day, Basil Fest, and a Fall Harvest Festival with garden-fresh food, music, children’s activities and Master Gardeners on hand to answer your gardening questions. To learn more, or to rent a garden space, visit prescott community gardens. YRMC’s Your Healthy Kitchen is one of the many ways that Yavapai Regional Medical Center provides health and wellness education to our community. For affordable, healthy meal ideas, downloadable recipes, tips, videos and more, visit yrmchealthconnect.org. You can also follow us on Facebook. I read this article and found it very interesting, thought it might be something for you. The article is called Summer Harvest at Prescott Community Gardens and is located at https://yrmchealthconnect.org/summer-harvest-at-prescott-community-gardens/.